kikkadigga has no other items for sale. Great Idea But not Quite The Dogs Nuts. 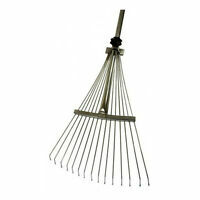 Firstly, it would not fit on my Bulldog digging fork, but did fit my Wilko stainless spade. Secondly, I had to keep stopping to re-fit the hinge like attachment, which is rather tiresome. Once attached it certainly works, and it’s a great idea but not quite the dog’s nuts. That said the kikka Digga is a snip at twenty five quid, and it does function. But it’s not as good as an automatic spade such as the Wolf Terrex and it’s modern copy. So to sum up, it’s cheap and it’s well made, therefore great value for money, but it doesn’t fit all forks or spades and it does have an annoying habit of coming off every row you dig. I am going to drill a hole in the socket, so that the bolt is captive. I think this modification will solve the slipping issue. 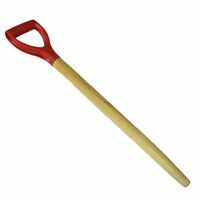 For £25 + delivery you can easily afford to give it a try, and the price is over a quarter of an automatic spade. I can honestly say that this garden gadget is great. I saw this featured in Grow your own Magazine, I'm very pleased I did. I've shown friends my kikka digga, a couple of them have purchased one. 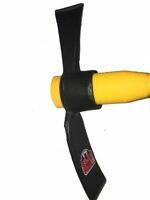 I would recommend anyone thinking to just go order one as it's a fantastic tool which really does make digging so much easier. Well thought design. Amazing! I got this digger tool direct from the Kikka Digga web site last summer, After seeing a review in the grow your own magazine, I was planning to break out a new area of my garden for some new vegetables I got from a neighbour anyone who knows anything about digging knows this is seriously back breaking work so after seems the great review it got I though Ok I’ll give it a go. 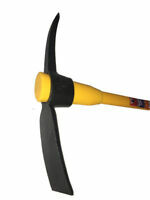 Best 30 quid I ever spent just like the review said with this kicker digging tool it was a breeze. No need to bend and lift just kick and dig like the name suggests. The foot plate made digging the spade into the soil so much easer you can get your whole body weight behind your spade to really dig it into the ground and then to dig the soil up simply pull back on your spade and the device turns your spade into a lever and it just rips the soil out of the ground easy as digging up daisies. If you do a lot of gardening definitely worth it. 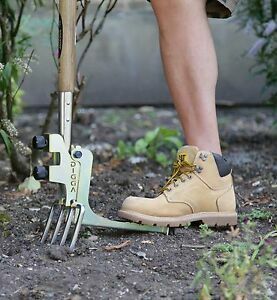 I was a bit wary when I ordered this, but I have to say it works extremely well, great for lifting small plants and it's well designed and durable, it would be useful if it fitted larger garden forks though, as shaft on my larger fork is too wide so have to use a ladies fork with it.